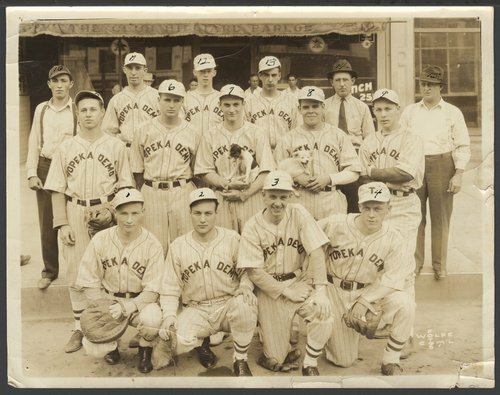 A photograph of the Topeka Demo (possibly Democrats) baseball team in Topeka, Kansas. In 1937, the team took second place in the city league. People in the photograph are: 1. Carl Brock, catcher; 2. Louis Lyman, right field; 3. Woody Woodruff, center field; 4. Butch Banfield; 5. Artie Stover, short stop; 6. Lefty Thierry; 7. Sheldon Applely, outfield; 8. Bob Liles, pitcher; 9. Ray Galletly, third base; 10. Bob Miller; 11. Wilkerson, pitcher; 12. Ernie Newman, outfield; 13. B. McKetlen, left field; 14. John Daley; and 15. Rudy Weber, manager.